Today, I’m going to the first postseason baseball game I’ve ever attended. 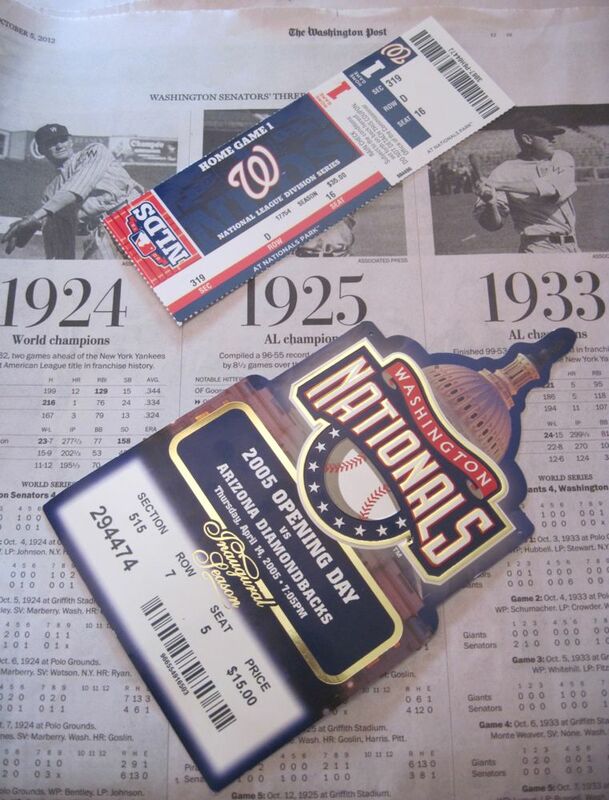 Game 3 of the National League Division Series between the Washington Nationals and the St. Louis Cardinals will also be the first major-league postseason game to take place in the District since Oct. 7, 1933. I didn’t quite allow myself to think that we’d reach this moment in the middle of July. Going back to a chilly April night in 2005, I was just happy to have a team with my city’s name on its jerseys. Now? The next few days or weeks may send this place into delirious enthusiasm or push it off a cliff into a level of sports-induced despair I haven’t felt since the horror of the Grady Little game, or maybe Georgetown’s Easter Sunday gut-punch loss to Davidson in 2008. Yeah, I’m kind of a mess right now. So if anybody needs me, I’ll be at the ballpark this afternoon. Go Nats! This entry was posted in Sports and tagged baseball, Cardinals, Nationals, Nationals Park, Nats, NLDS, RFK Stadium by robpegoraro. Bookmark the permalink.